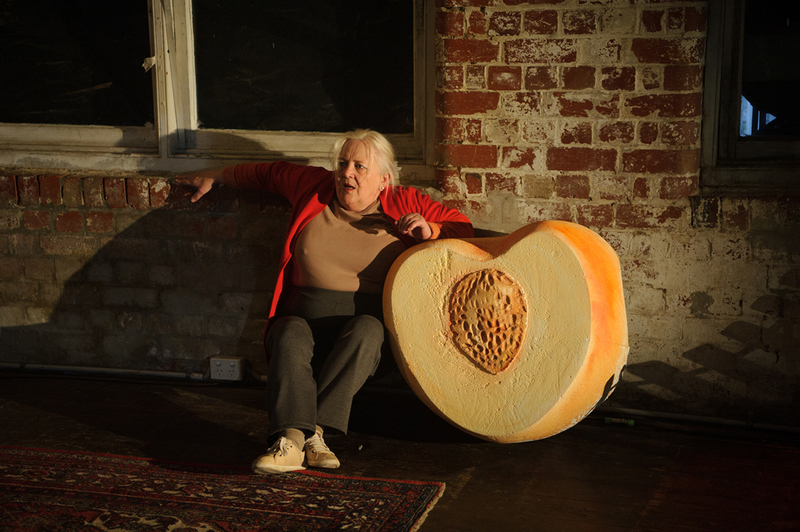 Black Hole Theatre’s The Book of Revelations invites audience members into a “performance installation” that imagines the interior world of someone experiencing dementia, a character named Ada. Writer Alison Richards, in the central performance as Ada, is both the inhabitant of this world — its progenitor — and victim of its surreal alarms. It’s a world where the variegated elements of an apparently vivid personality are splitting off from each other and in the words of director Nancy Black, “as they fall, each element exists, sparkles from time to time, but the fragments don’t cohere.” As the title suggests, The Book of Revelations presents this disintegration as a series of fantastical appearances, materialising from everyday existence, alternately wondrous and terrifying. Audience members wander around the smoke-filled set, peeking at and into arrangements of furniture, pictures, household stuff. An installation of cabinets houses a box of cutlery and one of photo slides; a set of cords dangle reading glasses and a hairbrush from the ceiling. We spot objects that must have more personal significance — a tiny fuzzy peach clings to the top of a column while a massive human-sized one lurks next to a park bench on the other side of the room. There are also peaches in the cabinets. Motifs proliferate but are distorted in shape or scale — the criss-crossed web of a rope ladder reappears in a slanted frame on the floor; doily patterns pop up here and there. The repeated warping of forms gives us a sense of Ada’s fracturing perceptions. 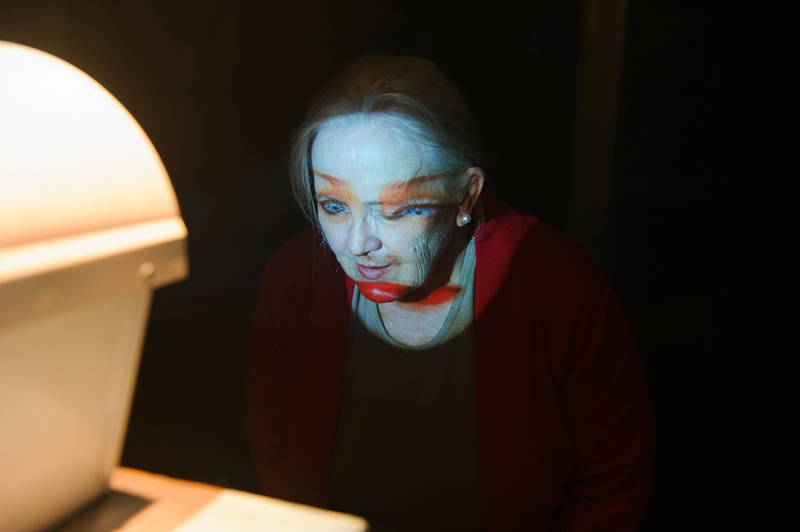 Although her world has more ‘through the looking glass’-style topsy-turvy than rawness or true horror, the production doesn’t treat the symptoms of dementia fancifully. We recognise anomia (the inability to recall words) as Ada lapses into a frustrated, “it’s on the tip of my… the tip of my….” People with dementia can also experience hyperacusis, a sensitivity to certain frequency and volume ranges of sound, making everyday noises seem unpleasantly or painfully loud. Through headsets, the audience hears ordinary sounds of daily life quickened with an hallucinatory quality and the occasional auditory shock. Bird twitters might be interrupted by the scream of a train grinding on tracks, a fly buzzes annoyingly, an opening door brings on thunder. “He has brought me a peach from the tree in my garden, the last of summer.” The question of what is real and what is fantasy, what is happening now and what is reminiscence, what can be done and what is hopeless, constitutes Ada’s conundrum. As she moves around the space — which could variously be her immediate external world, a landscape of events from her past or in her own mind — each object she encounters has the potential to conjure a memory, or a monster. An old bed is lit from below with a childlike carousel scene; a letterbox throws out a stream of colourful images that seep and morph over Richards’ transfixed face. 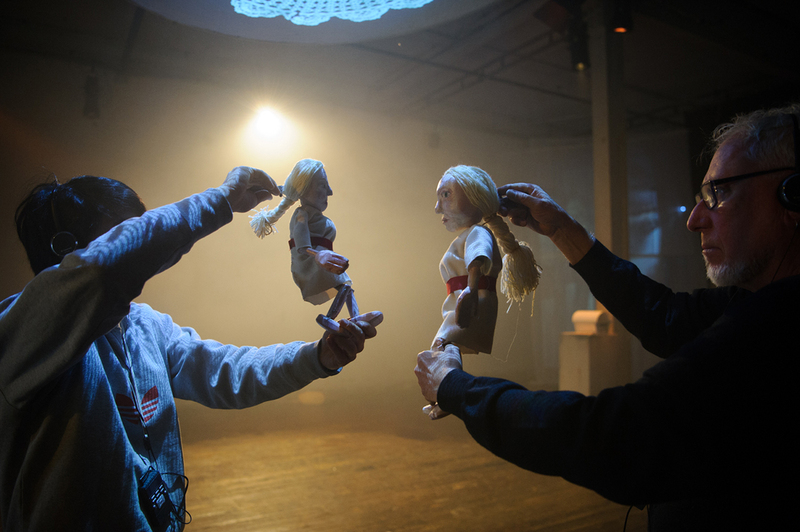 The work of puppeteers Rod Primrose and Bao Ghislain makes a striking contribution to the show. Towards the end of Ada’s ordeal, a mass of glossy, claret-coloured strips of celluloid emerges from a chest and hovers upward, assuming a benign seaweedy form: is this another monster? Or an angel? When Ada eventually runs from the room, she’s refigured in the form of two miniature rod-puppets who swoop and dance, mesmerising audience members. The larger one strokes the swollen, chalky cheek of the smaller one, suggesting a nostalgic relationship between older and younger selves. It’s a scene that epitomizes the overall impact of The Book of Revelations – the various design and production elements were inventive and gave quiet surprises, although at times I wanted a few drops of Beetlejuice surreality to darken the imagery. At times the sad, difficult aspects of dementia were movingly drawn – it must be a sad, difficult experience – but there were other revelations here too.